5 WAYS, SHORT & SWEET | jeni a. Since giving this blog a makeover a few months ago, I wanted a "Beliefs" page rather than just a link to mormon.org or lds.org. Those websites are tremendous resources for learning the tenets of my religion and faith, as well as for knowing how to live it, but I wanted to include here - in my own writing - how those beliefs have made me feel. Well that's easier said than done, I found. For one, I had to genuinely ponder and understand how I have felt positively different from living my faith. Then I found that so many, if not all, of my feelings, goals, and perspectives were directly linked to what I believe. My faith truly has been my lodestar as I've made both daily and grand, life-changing decisions, and it will ever be my guide. 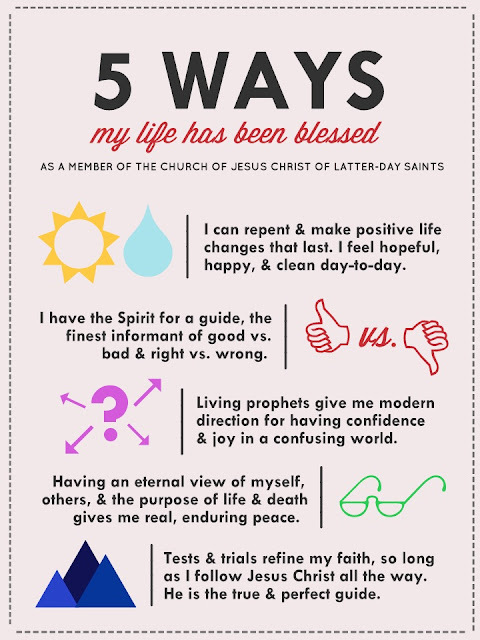 In the end, I decided to just share these five thoughts via a poster rather than a whole post. This way I had a limit - couldn't write a novel, had to say it short and sweet. More details here about Heavenly Father, the Spirit, living prophets, hope & happiness, and Jesus Christ - linked, of course, to the best: mormon.org and lds.org. I am so grateful to know about and love the gospel of Jesus Christ. It has led me to feel the greatest, most genuine kinds of happiness. I am at peace, all while living day-to-day with my unique trials and challenges in an often crazy, chaotic world. All is well, and when I say that, I mean it! You're rad. Turning your beliefs into bullet points, then pictures, then sharing them with the rest of us. I love you so for inspiring me through and through.